Leaf blowers take the hassle out of yard cleaning, and whether you need a small blower to handle patio debris or a large one to keep acres of land clear, the perfect leaf blower is out there for you. To help you find it, we have put together this leaf blower buying guide that includes everything you need to know to pick the right type of leaf blower with the perfect features at just the right price. 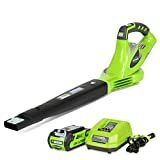 Electric Leaf Blowers: Specifically designed for small home jobs, electric leaf blowers can be either corded or cordless depending on your preference and budget. They are a much quieter solution for small to medium yards. 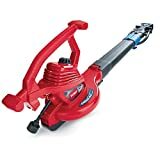 Gas Leaf Blowers: Gas leaf blowers pack a lot of power and come with either two or four-stroke motors. A professional solution for bigger yards, gas powered leaf blowers offer users more movement flexibility. Sweeper Leaf Blowers: If you are looking for something smaller to clean your patio, deck, or driveway of pesky leaves, then a sweeper is what you need. Electric or gas powered, sweepers are a compact option for smaller homes. Standard Leaf Blowers: Offering a variety of blowing power and sizes, standard leaf blowers can be gas or electrically powered. Available in models suitable for small to large yards, they make an ideal home leaf blower solution for standard homes. 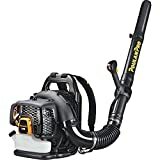 Professional Leaf Blowers: Normally gas powered, professional leaf blowers are the largest and most powerful models that can clear big properties or be used for commercial use. Backpack Leaf Blowers: Backpack leaf blowers offer more leaf blowing comfort. Easy to carry, these leaf blowers are ideal for landscapers and avid gardeners. Walk Behind Leaf Blowers: These heavier leaf blowers are designed for commercial use, and units include wheels for easy maneuvering. Size: For consumers, weight is a big issue, especially for non-commercial use. The smaller and more the compact a model is without compromising too much on power, the better the reviews are. Choosing a good quality model with such reviews will ensure you get the most use out of your new leaf blower. Power: Power is a big talking point among reviewers and leaf blowers lacking sufficient power are not reviewed well. Adjustable power settings also go a long way to guaranteeing buyer satisfaction and powerful blowers that offer varied speeds for light and heavy duty jobs are the most popular. Noise: When it comes to operational noise, electric leaf blowers are the top dogs with owners noting that their blowers make a lot less noise. This makes them an ideal choice for residential areas where noise may disturb other residents. Warranty: Leaf blower owners value models with longer warranties and view quality leaf blowers with 5-7 year warranties as a sound investment. Choosing a reputable brand with good reviews not only ensures that the blower is durable but also guarantees better customer services and warranties in case something goes wrong. The first thing to ask yourself when buying a leaf blower is where will you be using it and how regularly will you need it? For smaller areas when use is infrequent, a smaller, more cost effective leaf blower will be sufficient. For larger jobs, a better quality blower with more power will save a lot of hassle and time. Consider the weight of the machine. Leaf blowers tend to be heavier the more powerful they are, and it’s important to try to balance the power you need with a weight you can manage. 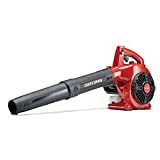 The blowing power or speed of a leaf blower, as with all air compressor equipment, is measured in CFM (cubic feet per minute) and the higher the number, the more powerful it is and the more it will clear. Sweeper leaf blowers and similar units with CFM ratings below 200 are best suited for patios. Blowers with CFM ratings between 200 and 400 are great for light duty clearing. For medium to heavy duty needs, choose a leaf blower with a CFM rating of 400 to 500. CFM ratings over 500 are considered the most professional leaf blowers and pack the most amount of power. Combination blowers that convert to vacuums or mulchers will simplify your yard work by not only clearing debris but by allowing you to vacuum or grind debris for easy cleanup. Additionally, they can save you money from having to buy a separate leaf mulcher. Noise is an important factor, especially for residential areas where houses may be closer together. The noise of a leaf blower is measured in decibels (dBA) and the lower the number in the product specs, the quieter the leaf blower will be. The difference between two-stroke and four-stroke gas leaf blowers is that in the case of the latter, users don’t have to mix gas and oil to run the blower as you would for smaller engines. However, two-stroke engine blowers offer great value for money and come in more convenient, lighter builds. A recommended feature to consider is adjustable speed settings. These will enable you to control airflow and debris movement and allow you to change between speeds as circumstances require. Look for a cordless blower that shows the run time, as this will indicate how long the device will run before it needs to be recharged. It’s a handy way to ensure you always have enough charge to get the job done. Some accessories you may want to consider buying with your new leaf blower are earplugs to protect your ears and safety goggles to keep your eyes safe. 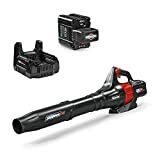 Black & Decker: Since 1943, Black & Decker has been a household power tool name offering a variety of top rated quality power tools for the home and garden. Husqvarna: With a history dating back almost 400 years, Husqvarna is one of the world’s leading outdoor equipment brands, known for their top rated products such as leaf blowers. Hitachi: Hitachi is a power tool conglomerate that was formed in 1948. Today they are known for their innovative quality tools including leaf blowers. 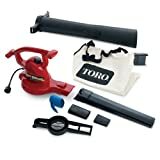 Toro: Toro is a worldwide provider of turf, landscape, yard, and construction equipment and provides quality yard tools such as blowers for the home and for commercial use.